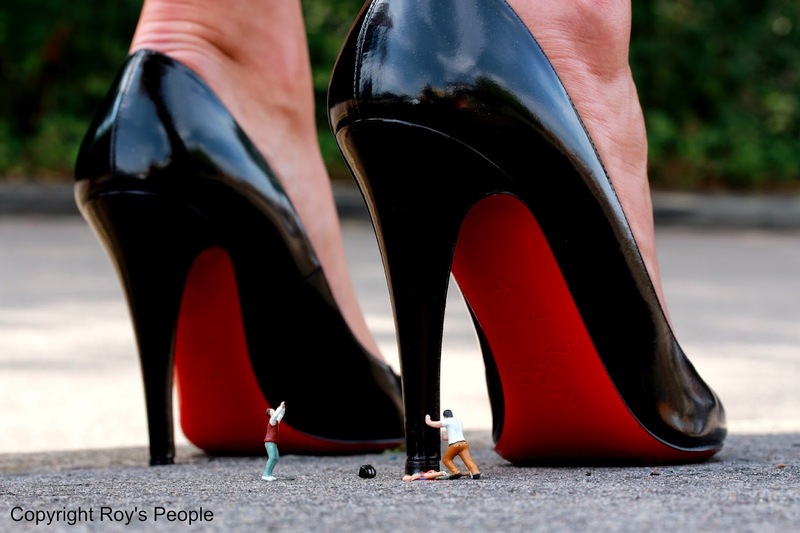 The idea of miniature people picking their way through our lives is seductive. From the fairy circles of folklore through the 1957 film The Incredible Shrinking Man to Mary Norton's The Borrowers, audiences thrill to the idea of another world hiding in plain sight. 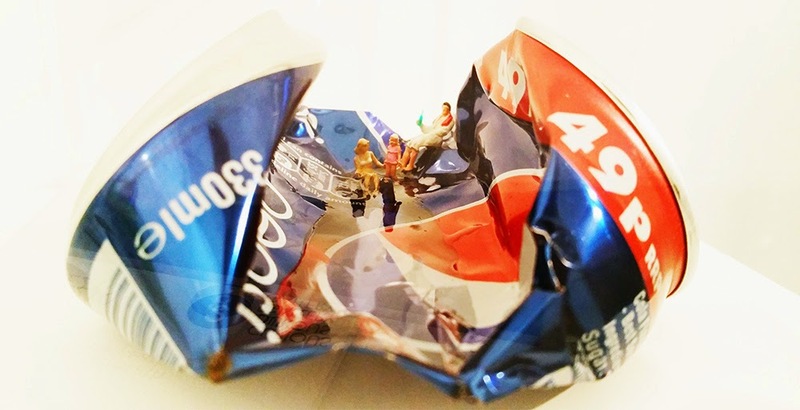 It's also experienced a small renaissance in urban art, with Slinkachu, Marcus Crocker and Roy's People all creating miniature dramas, comedies and tragedies right underneath the noses of unsuspecting Londoners. Little Heroes proves to be an exhibition of two halves: one informed by politics and punky satire, the other by superhero poptimism. The latter is familiar territory for the artist, subverting the urban landscape by hiding tiny, pointed messages in plain sight. Here discarded bottle caps are repurposed as umbrellas, drug dealers and their clients haggle over the price of a gigantic ecstasy pill and a man aims his rifle at a gigantic Twitter symbol. A decent chunk of the appeal comes from their positioning. Roy periodically creates these tiny models and hides them across London (and other cities and towns), including a little note that explains what they are. This gently subverts the urban space into a creative one: even though the chances of discovering one are minimal, the knowledge that they're out there is a thrill. Even within the gallery there's rewards for the eagle-eyed observer - men sat cross-legged on power sockets, pursuing each other across picture frames or strutting along the skirting board. In the iconography there's a strong street art influence; repurposing corporate iconography to create bitesize political statements. This dovetails beautifully into a view of the individual dwarfed by corporations. As they clamber over crumpled drinks cans or vainly try to shove a pair of colossal Louboutin heels off a body, the traditional relationship with trademarks, style and brand is subverted - the public revealed less as consumer and more as victim. This is best exemplified in my favourite piece here, Obama's Bandits. Here we see the President and First Lady perched atop a crumpled Budweiser can, with three machine-gun wielding cops in front of them. They're facing off against an angry crowd of protesters, with one man bleeding out on the ground in front of them, his fallen placard reading "Stop Racist Police". It's almost too blunt, but that just amplifies the indignation, the piece bristling with commentary on race, violence and the sinister entanglement of business and politics. That's all great stuff, so it's a shame that the superhero themed works that give the exhibition its title aren't quite as good. These show tiny figures casting giant silhouettes of DC and Marvel heroes - Spider-man, Batman, Superman, Catwoman, Hulk and so on. The implicit message is that no matter how downtrodden you may feel, you have the spirit of a superhero lurking deep you. It's an unabashedly optimistic outlook (one I can't really disagree with), yet feels at odds with the rest of the work. As noble and benevolent as these characters are in their fictional universes, they're as much corporate symbols as Coke cans and McDonalds restaurants, elements that the artist is eager to satirise elsewhere. In deifying them like this there's the uneasy promotion of assimilating corporate IPs into our psychology. Also unexamined is the adolescent power fantasy represented by the superhero. There's just something a bit shallow about the implied positivity of a man imagining himself as Batman - presumably fantasising about being a billionaire vigilante assaulting the poor in dank alleyways. I guess it boils down to the simple fact that superheroes are incredibly popular right now and that works featuring them are more likely to sell to apolitical customers. After all, the artist has to put a crust on his plate, and going a bit commercial is hardly the worst crime in the world. Still, there's the sense that this is ever-so-slightly the easy way out: riding on the coat-tails of Warner Bros and Disney's intellectual property rather than subverting it. Even though I didn't much like those, there's still more than enough crammed into Curious Duke to make Little Heroes a more than worthwhile visit. Throughout there's a clean, clear and attractive aesthetic sense which, in combination with heaping dollops of creativity and an anti-authoritarian streak make it easy to recommend. Check it out! 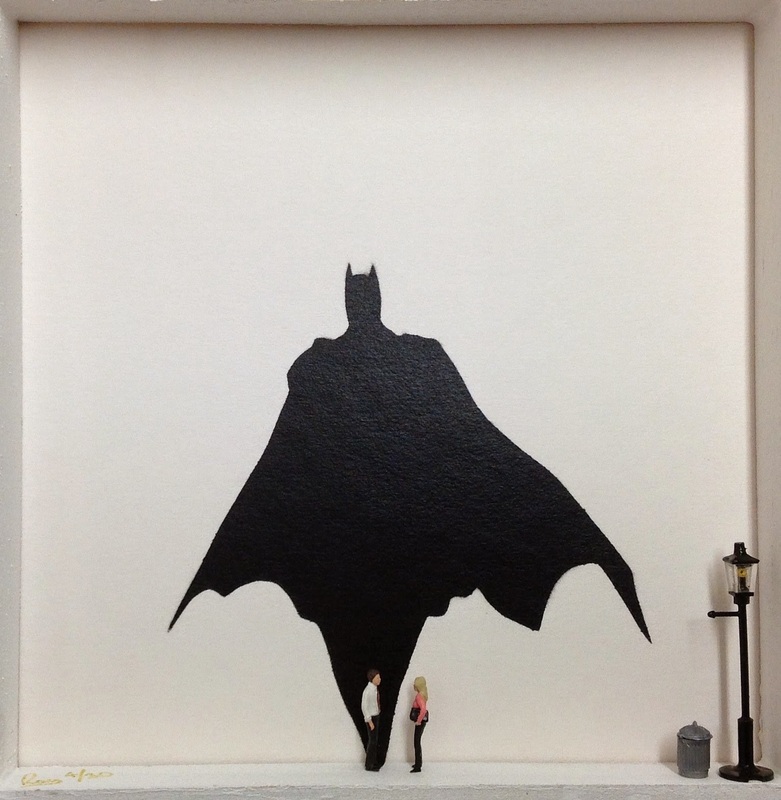 Little Heroes is at Curious Duke Gallery, Whitecross Street, until 9th May. Information here.